“What are you going to do with those?” Asked an elderly woman eyeing the artichokes I held like a bunch of flowers towards the busy fruttivendolo, waiting my turn to pay. There are many reasons why I prefer shopping at the farmers’ market to shopping at the supermarket, and this is just one of them. Each and every visit to my local market in Florence has always been a learning experience. Particularly when this happens. Fellow market goers want to know what you’re cooking and how you prepare those early spring artichokes or they’ll give you their advice on the vegetable you’re both standing over. It’s a wonderful little exchange of information that may come with an anecdote or a recipe or it might simply spring out of curiosity. After years of visiting the Sant’Ambrogio markets in a corner of Florence, week after week, I should have kept track of all the snippets of information given to me by old ladies or the stall holders themselves. 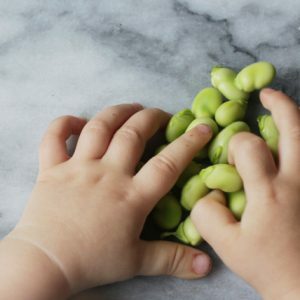 Nevertheless, even without writing them down, they soaked in – I’d take home my bag of groceries, along with the new method or recipe echoing in my ears, and, inevitably, try out the new idea. Sometimes it was an impulse buy, like that of freshly foraged, bright orange-capped ovoli, Caesar’s mushrooms one late summer morning, that I honestly had never cooked with and possibly could have ruined completely were it not for the wisdom of the market. 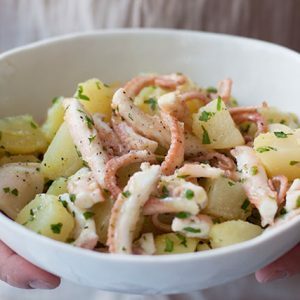 Insalata, I was advised, was the best way – sliced raw, dressed simply with the freshest, most peppery extra virgin olive oil you have and a squeeze of lemon juice. A divine, utterly magical meal. And then, with pappardelle – sautéed and tossed through the pasta with wild calamint, because, as any Tuscan nonna worth her salt will tell you, calamint always goes with mushrooms. I learned a great deal about the essence of Italian cooking from my regular visits to the markets. 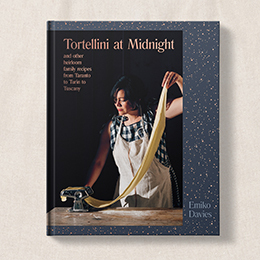 The strict adherence to the seasons – everything has its time and place, even if it means waiting all year for it; the wonderful simplicity of the traditional recipes – so good that there’s no need to do anything different from the favourite ways to prepare those dishes; and the little things that nonnas might pass on to their grandchildren in the kitchen. She proceeded to explain that the elongated bulb that I was holding was a female fennel, which was stringy and less flavourful compared to the sweet, rounded male fennel. Who knew how many times before this I had picked out the more fibrous, less tasty fennel? Now, armed with this little bit of information, passed on generously by this market nonna, my fennel salads would be bursting with flavour. It might be officially spring here but the very last of the blood oranges are still around. It seemed a good opportunity to make the most of the end of the season by putting together this classic Sicilian winter salad. This traditional salad changes from household to household. In its simplest version it has just blood oranges, sliced and seasoned with a pinch of salt and olive oil. In more elaborate versions, it can include green or black olives, anchovies, fresh chilli, green onion, even smoked fish. This is somewhere in between. 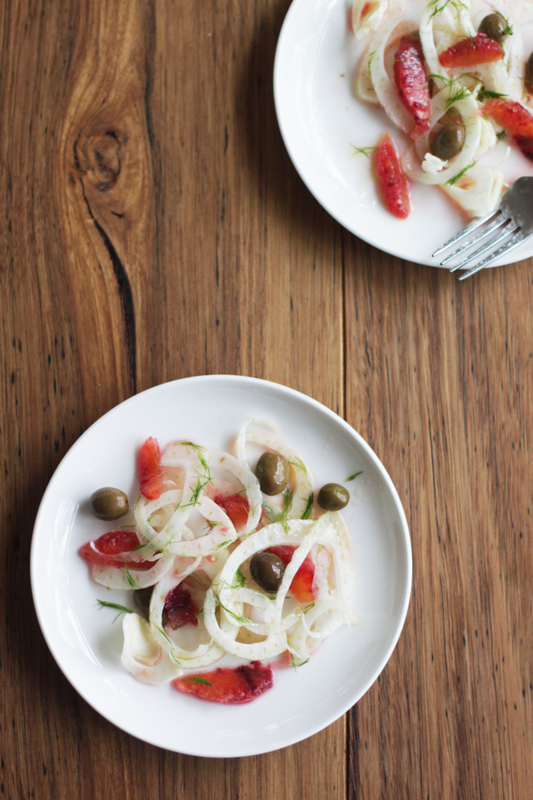 Toss the fennel, orange slices and olives in a bowl and combine. In a small bowl, combine the juice of half an orange, extra virgin olive oil and salt and whisk to form an emulsion. 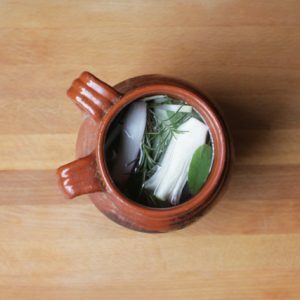 Dress the salad with this mixture and garnish with some fennel tops. *Talking Cookbooks reminded me of these market visits – it’s a great initiative started by Barbara Sweeney of Food and Words that you can find at Sydney’s Eveleigh Markets. Just made an impulse buy but not sure what to do with it? Visit the Talking Cookbook stand and Barbara will talk you through it. Not sure where and when exactly I learnt about the female/male fennel thing, but that’s true, and it has worked form me ever since. It is almost that time of the year here – fennels, I am told, are still not quite the right texture, and oranges are a few weeks away, but oh, am I awaiting that moment eagerly…Yes, at the core of Italian cooking, surprisingly, is patience. I had a similar experience here in London 5 or 6 years ago – a more experienced shopper shared her knowledge. Up till then I’d always reached for the elongated fennels too – I wonder where I picked that idea up?. It pays to talk to your fellow shoppers, you never know what you’re going to learn. Still waiting for good fennel here. My attempts to grow it have always ended in the bulbs bolting so I look forward to their arrival. 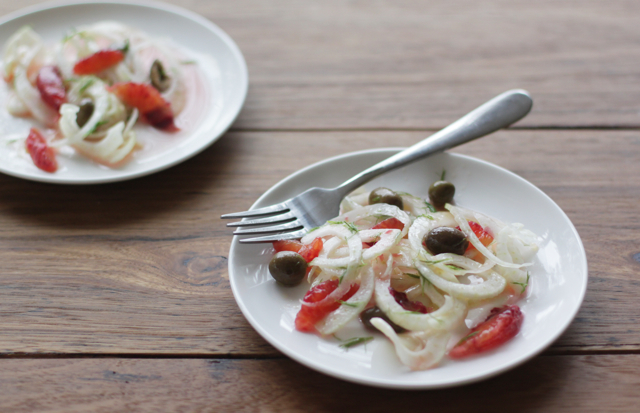 I’ll make this lovely salad when the fennel and blood oranges coincide here. Oh it always moves me when someone shares their knowledge of food at a market or shop, something they don’t have to do, but do with generosity. I love fennel and didn’t know about their gender either, I will look out for it now. A lovely fresh dish this is! It’s the same at my local organic farmers market. We share recipes always with other customers and the farmers too. I love how you can get recipes and advice on anything you buy at small shops in Italy! None is afraid to give his/her opinion there! I did not know this thing about the gender of the fennel bulbs either – admittedly, at least here in Rome, I haven’t come across the long-ish ones much. I love chatting with fellow shoppers at the market – a good way to train my ear to better understand different dialects and a perfect way to pick up a few cooking tips (even if advice from one shopper can often lead to ferocious debates with other shoppers just how a certain dish should be prepared). Ever since eating some fennel and chilli marinated olives I have become a convert to the combination of fennel and olives, although I have yet to try this classical salad. Rightly or wrongly, I think the flavour combination would work wonders in a dessert – I am thinking some fennel granita with bloodorange segments and sweet and savoury black olive, fennel, peperoncino and honey biscotti and maybe a dollop of smooth ricotta would be lovely to end a meal. Yes, I wonder (if everyone’s in the know about the female ones being stringy and not as flavourful) if there is a good use for them at all? Something to check out, I think. Fennel and olives are a great combination, interesting your thoughts on it in a dessert — did I see something like this on your instagram feed? Hm, I had no idea! Thank-you! Might try this with the grapefruits I have lying around. Oh yes, would be nice and tangy with grapefruit! 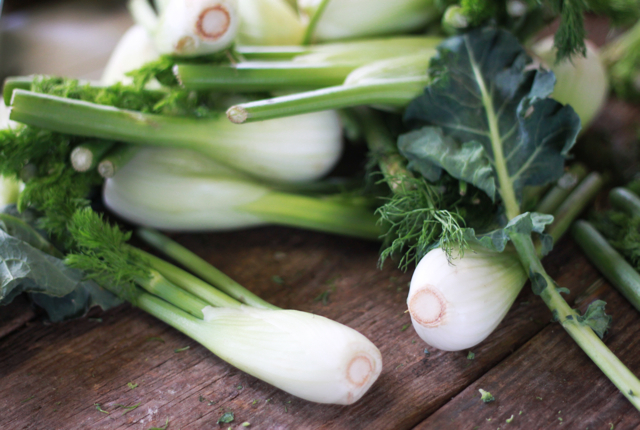 I did not know there was such a thing as male and female fennel – I will look out for that next time I shop! Lovely salad. You cook or bake the female fennel – it’s delicious, especially with the sweet black olives you can buy at the Esselunga in Florence, or (but more expensive) at one of the stalls at Sant’Ambrogio. I wrote a lot about food in Florence, where I lived for 32 years. The stories are published in “The Florentine.” They can also be read on my website – http://members.shaw.ca/seiche. 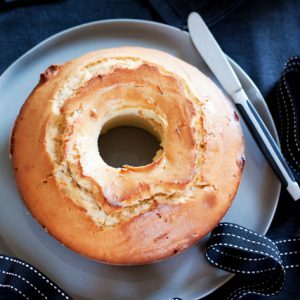 Great idea Sabine for baking the fennel – one of my favourite ways to have it! 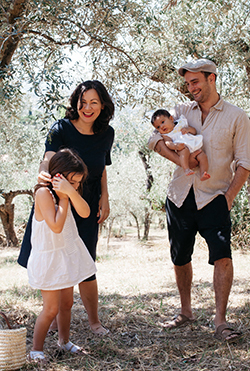 I’ve seen you in The Florentine, I wrote the Food & Wine column for a while too!